USD/JPY is currently trading around 110.82 marks. It made intraday high at 110.93 and low at 110.52 levels. Intraday bias remains neutral till the time pair holds key resistance at 111.00 mark. A daily close above 111.00 will take the parity higher towards key resistances around 111.36, 112.60 and 113.98 levels respectively. On the other side, a sustained close below 110.45 will drag the parity down towards key supports around 109.42, 108.49, 107.65 and 105.25 levels respectively. Japan Jan 2019 exports yy decrease to -8.4 % (forecast -5.5 %) vs previous -3.9 % (revised from -3.8 %). Japan Jan 2019 imports yy decrease to -0.6 % (forecast -2.8 %) vs previous 1.9 %. 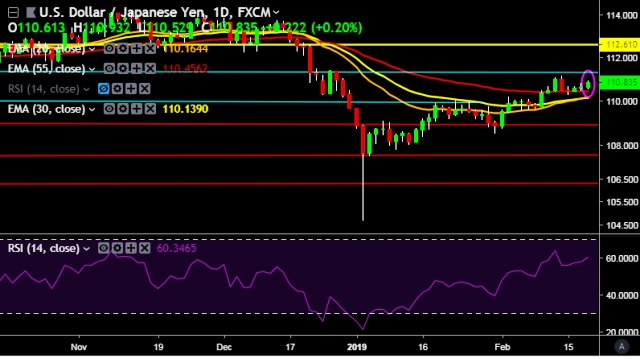 Japan Jan 2019 trade balance total yen decrease to -1415.2 jpy (forecast -1011 jpy) vs previous -56.7 jpy (revised from -55.3 jpy). Tokyo's Nikkei share average opens up 0.20 pct at 21,346.04.